Ok ladies, let’s talk about the S word – SAFETY! Having kids around the house means every little detail needs to be thought of when it comes to safety. Even the slightest oversight could end in disaster. I’ve made a list of some important safety products I have around my place thanks to Dreambaby®. It’s a brand I’ve loved for years since having kids, and you need to know about some of this stuff! Trust me guys, it’ll change your life. I like to give the girls independence now that they are much older, like brushing their teeth on their own and helping me with things around the house. 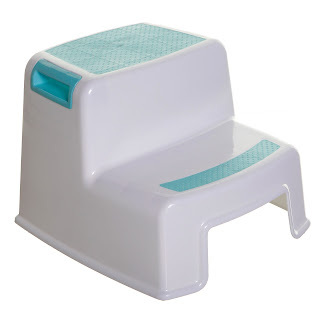 We use the Dreambaby® 2-Up Step Stool to help them get to higher surfaces safely. It has a grip top, two handles to help make it easier for their little hands to carry and it’s very easy to clean. They can grab it whenever they need it and I don’t have to panic that they’ll hurt themselves. Madison has been fully toilet trained for a while but now is starting to use our toilet (yay!). No more potty! 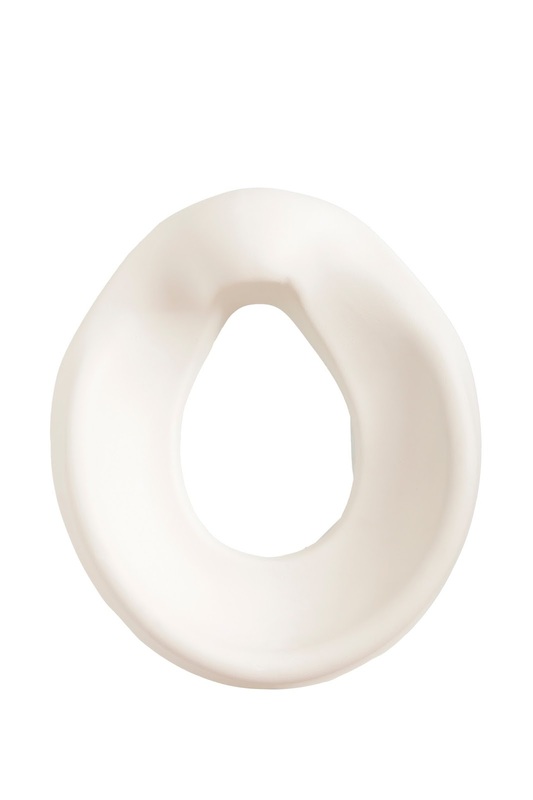 She loves using this Soft Touch Potty Seat as it makes her feel like a real grown up. We take it when we go out to the grandparents’ house and she feels much more independent when she uses it. There’s an anti-slip surface which makes it easy to position on your existing toilet, and it’s made with high moulded back and sides for premium comfort. Have you seen this? 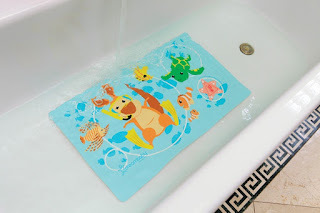 I love this clever little bath mat. There are multiple suction caps to keep it secured, and it changes colour when the water is too hot. Perfect for helping to preventing burns and uncomfortably hot bath water. Anyone else’s child find the need to touch the bath spout, as well as knocking themselves? I’ve finally gotten around to getting one of these. It protects the spout with a soft cover so nobody gets bumped and bruised. Of course, this is not a substitute for adult supervision, but this can help avoid knocks and give you even more of peace of mind – must have when baby-proofing. Madison is in her “big bed” and I’m such a stress head that she’s gonna fall! Having a bed rail has been my sanity-saving best friend. 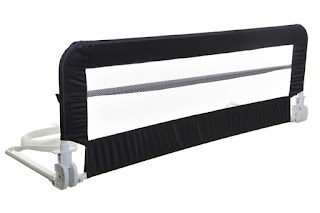 We use the Harrogate bed rail, and it’s so easy to assemble and disassemble, and it’s got a breathable mesh, which is very important for me in picking a bed rail, and really gives this mumma peace of mind! We have the navy blue colour and it really looks lovely against her white bed. Madison and Macie still need a light on at night. 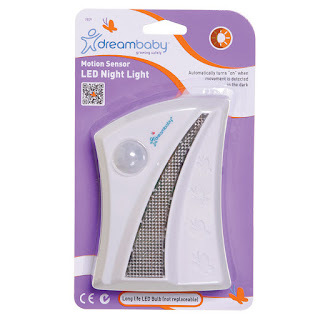 We tired out this movement night light and it’s worked wonders. It automatically turns on in the dark when movement is detected. So, if they’re sound asleep, it won’t switch on, but if they wake up scared, it’ll light up and reassure them that everything is ok. It uses a long life LED globe and can easily be wall mounted or stand upright. 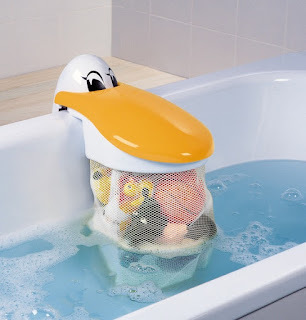 How many bath toys does your child have? We still have LOADS! This play pouch is super easy to install and so cute! It actually makes the girls want to pack their toys back in as they get to open and close the pelican’s mouth! My bathroom has never been so tidy! I have SO many of these – they’re a total baby-proofing staple. Those little ones are so curious, and even the most unassuming corners can cause injury. You can never have too many I say! They help prevent bumps and scratches from sharp edges and corners, so they’re ideal for desks, tables and shelving. I really can’t emphasise enough the importance of safety at home with kids. Whether you have kids yourself or you’ve got friends and family visiting with tots, always make safety your first priority. I hope that some of these gadgets will help make your home a safe and fun environment for kids to enjoy! Let me know if you’ve tried and loved any products, too! These all sound so good! I love the toy bag, it’s the cutest little storage bag! Those stools used to come in so handy when my son was younger! What great tools for when you have kids! How clever is the Anti-Slip Bath Mat! 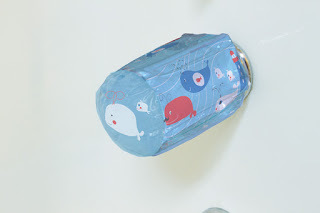 I want to get the Peli’s Bathtub Play Pouch too, it is so cute! Such a nice roundup of all the essentials. I just bought the bath tub spout cover for the kids safety while bathing. I am looking for bed rails as they are transitioning from crib to bed.